Tonight’s episode just like the previous one had many important developments to its credit. The writer showed the consequences of the step Tabbasum had taken from different angles and everything was shown realistically with the exception of the fact that Tabbasum didn’t mention her children even once. The most pleasant aspect of this drama is that even with all the opposition which Tabbasum is facing, she never questions what she has done. She is still very sure that she did nothing wrong and is not shown regretting her actions. Nadia Khan’s acting tonight was relatively better but her styling and make-up once again looked completely out of place. This drama has raised some important points and it has done so impressively. 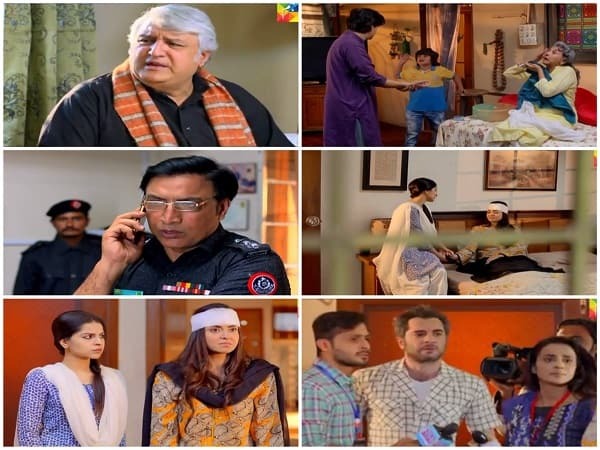 This episode opened with Sajjad struggling with only half of what Tabbasum was doing on regular basis. Bi Jaan continued to give everyone a tough time because she is convinced that it is her god-given right to dictate to everyone! Even though she can see that Sajjad cannot cope but she is still pressurizing him to divorce Tabbasum. Her expressions in the last scene however suggested that she had come up with a different plan! Many of the scenes in this episode showed how “common” it was for men to hit their wives and how most people still failed to comprehend why was the state involved in this matter. Since this drama was written a few years back therefore it shows how difficult the execution of this law was in the early years of its implementation. The scene at the police station showed confusion and even though the officer incharge wanted to make a good example of this case but he wasn’t getting the support he needed and the law itself was not clear. This goes to show that the state has a huge responsibility when they make such laws public. Sajjad’s meeting with his lawyer was also important because he suggested that Sajjad should apologize since there was no other way out. Basically, both these scenes suggested that the only way out for Sajjad was to apologize and bring Tabbasum back home therefore even with the lack of clarity the FIR guaranteed that Tabbasum had some degree of protection. Omair Rana has translated different shades of Sajjad’s personality superbly on screen. So far Sajjad also doesn’t feel any regret, his ego won’t allow him to reflect upon his actions and he is also surrounded by people who give him wrong advice. The scene in which Marium was wondering what happened to her brother’s perfect life was one of my favorite scenes from this episode! It was ironic how she contributed so much to this tragedy yet she blamed it all on someone’s buri nazar! Khalid Anum and Hina Bayat both are absolutely phenomenal in their respective roles. Their realistic and convincing performances makes it easier to understand their characters. The actress playing Fari’s role and the actor who is playing her class fellow’s role are standing out like a sore thumb. Their performances and their overall look is distracting to say the least! Tabbasum and Fari’s relationship however is heart-warming. The child stars have also done complete justice to their characters. You feel for the kids more than anyone else since they are the ones suffering the most. Shamim Hilali has played her role superbly too. This episode brilliantly covered the role of the media during such personal upheavals. We see our channels making the most of tragedies worse than this one only to get viewership. This negative aspect of freedom of speech and independence of media needs to be highlighted and tonight all the scenes covering the role of media did so impressively. Even though these media personnel tell the public that they are helping the victim but that is not the case. It is all about ratings and personal gains. Zun Mureed is turning out to be a game changer in many ways. This drama deals with domestic abuse in a brand new way. It sends out a clear message which is easy to understand – it is not okay for men to hit their wives, there is nothing ‘normal’ about it and a wife has the right to protect herself without being accused of being disloyal if something like this happens! Kankar was the only other drama which highlighted this issue in a similar manner but Amna Mufti’s take on the issue is different because it also involves the state and legislation apart from many other things. The miscasting has definitely affected the overall impact of different situations. The drama overall would have been perfect if some of the cast members gave a more solid performance.